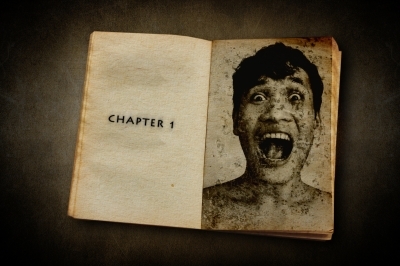 The Book Garden: Would you like some phobia with that book? Some books are quite scary like, say, your average horror novel. There may not be a cure for the effects a Stephen King novel has on you, other than not picking it up in the first place. Besides, some readers (including myself) take pleasure in these bloodcurdling stories despite or maybe because of the fear they induce in the literary adventure we love to immerse ourselves in. Of course, if you think that horror novels are the pinnacle of all that is (bloody) scary, you're wrong. There are worse things to fear when it comes to books. And I'm not referring to the ever-present risk of getting buried alive underneath your TBR piles in the event of a major earthquake. And you thought Carrie was scary. Oh wait did I just put some fear into you with that fully unintended little rhyme? Seems as though you're a borderline metrophobic then. If it's any comfort, things could be a whole lot worse. Fear of writing in general won't be helpful if you want to be the worlds most prolific author. Same goes for a sudden onset of bibliophobia. Not as though I were an expert of phobias, but if they can show up like allergies, from one day to the next, completely unexpected, this must be a book-lover's worst nightmare. Literally. While compiling the above list I was wondering why there is no such thing as fear of authors or libraries. Of course they could simply be lacking an official name. Or the list of phobias I searched through is incomplete. Maybe it's just my cruel imagination, but those don't seem all that far fetched either. Maybe only lacking a name yet. But let's not dwell on even more things one could be scared of. Let's try to find a cure for the ones already known instead. A cure? Let's not get ahead of ourselves and start by asking the question which of these phobias could actually be relatable. The only phobia that might qualify must be papyrophobia. Why? In case you're a klutz who's prone to paper cuts and can't stand to see your own blood, you know the answer to that one. What's a bookaholic to do if the fear of paper suddenly strikes? Any guesses? Why, buy an eReader and be done with it. As an afterthought - I kind of like the concept of logophobia, at least when you look at it from a different angle. You know what they say about the pen (which happens to be putting those words down) being mightier than the sword. Some words should be feared ... more than a tiny papercut. Have you ever heard of any of these phobias? Which one do you consider to be the worst? Please share. i never hear of those... papyrtophobia i could understand as some are allergic to paper ( yes, yes strange but allergy aren't predicatble) so if the allergy is hard on a person i could understand why she would fear the paper. I can understand Papyrophobia, I've had some days where I've been covered in papercuts. I'm currently reading about OCD and it's interesting to think that some of these phobias could result from OCD sufferer's illogical thoughts.